Smith Tennis is ready to gear up for the fall of 2017. Leading the charge will be Samantha Peikes and Joanna Kim. Both veterans to the Smith team and we look forward to their leading the 2017-2018 Smith College Tennis Team. 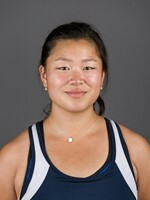 I am Sam one of the captains for the Smith College tennis team. I am from West Hartford, Connecticut, but I have been spending my summer in Delaware working for a Marine Research and Rehabilitation Institute in addition to working as a fellow for Our Climate, which mobilizes college students to put a price on carbon as a response to combating climate change. I was studying abroad last semester in the tropical rainforests of far northeast Queensland, Australia. It was an incredible and unforgettable experience, but I am eager to get back on the courts to play the sport that I love so much. I had a summer internship at NASA Ames, Mountain View CA researching how deep space affects our bodies. There seems to be one, overarching goal for NASA: go to Mars. That's at least 6-8 months of space travel, and we don't know how or to what extent cosmic radiation or microgravity affects our bodies. My project specifically looks at how our eyesight worsens because of microgravity - it's hypothesized that Cerebral Spinal Fluid (CSF) localizes in our heads without gravity to centralize it. CSF applies pressure to the back of the eye and optic nerve, causing the back of the retina to flatten, which is causing astronauts to come back far-sighted when they had perfect vision pre-flight. I am very eager for the Smith tennis season to begin. Congratulations to all of the team members for finding the balance between academics and athletics and for those who have excelled in both. 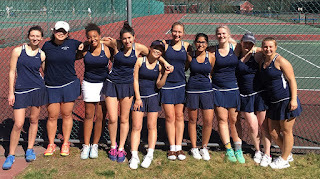 Smith Tennis-Finished Strong This Spring! What is your philosophy about competition? 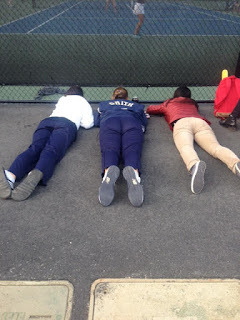 What is the Smith Tennis Team philosophy? Is being part of a college tennis team all about winning or are there other, more important, factors? Certainly winning is a nice product and winning says "success" but this year's team might say that cohesiveness is one of the most important factors and getting there is not by chance. Growing closer and stronger often comes through trials and challenges. Meaningful experiences often are born out of hard work and sacrifice. No one wants to hear that the experience of growth is from hardship but that is often the case. 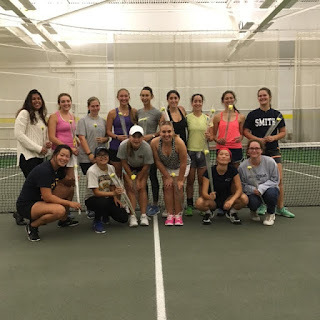 The Smith Tennis Team grew closer and stronger through their hard work in overcoming adversity, encouraging one another and trying to always find the positive. They rated themselves, for the most part, on their quality of play and the effort they put into the competition rather than the result. Did the team win the conference or the Seven Sisters' Championship. No. They were not close to the top this year but that did not seem to deter their efforts or dampen their spirits. What the team did achieve is almost beyond words. They became unified, focused, supportive, inclusive and determined and they laid the ground work for a fall that will build on that strong foundation. Check out these photos and see what you think. The seniors will be missed but their positive influence will be felt as the newcomers are welcomed in less than two months. The returning players are committed to share the life lessons learned this past year and to relay those lessons to the newcomers. It was, no doubt, hard work but it certainly seemed to pay off in the end. Samantha Peikes will captain the team in the fall and she will be joined by a second captain mid-fall. It is predicted Sam will take the court with her "no nonsense" approach to the game and her sheer love of tennis. Sam is a true student of the game. Her leadership is contagious and Sam will be sure to have a following of teammates committed to the same mind set. What will be next will be the result of this philosophy and the prediction is success of the most important kind. Best wishes to Smith Tennis this summer and look to great accomplishments this fall! All good things must come to an end and such it was for three seniors tonight but not before history was made by one. Margaret Anne Smith opened play by singing the national anthem one more time in her last appearance on The Smith College Tennis Team. She then took to the court in doubles with Joanna Kim. The two formulated their new partnership during the match and defeated Thompson and Simoes from Johnson and Wales 8-3. Margaret Anne then stepped up for singles. 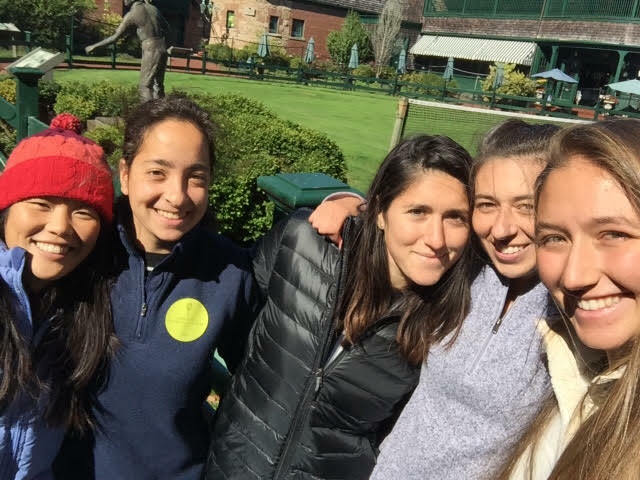 She was not deterred when asked to play number 1 singles when Noa Dubin was sidelined with an injury and Joanna Kim was nursing a sore shoulder. Emmay was stellar on court this evening gathering information, analyzing and calculating her strategy throughout the first set and taking charge in the second set anticipating her opponent's every move and answering with steady confident play. 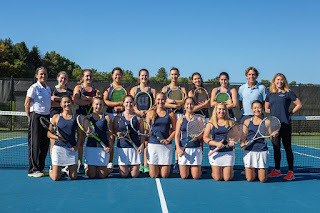 Mentally strong and always positive, Margaret Anne capped off her tennis career at Smith College with a decisive win and was immediately surrounded by her teammates to celebrate the moment (https://www.instagram.com/p/BS4v858FXSV/ ). Her words before the match: "Bring it on, I'm ready" and ready she was to go into the history books as a Smith Tennis success story! Winning 7 out of the last 9 matches this season, Emmay remains the winningest player on the Smith Tennis Team for the last four years. She has captained the team for the last two years and she has been a terrific role model both on and off the court. She will be missed but her love of the game and her fierce competitive nature will remain as an inspiration to this team and those to come. The fall tennis season for Smith Tennis came to a climax the weekend of October 14-16 with 10 players selected to compete in the New England Women's Intercollegiate Tennis Tournament. The event is a highlight of the fall tennis season for colleges and Smith College continues to host the prestigious 20 plus team event in conjunction with Mount Holyoke College. This event showcases our Smith facility and the tournament showcases many of the best division III players in the northeast. 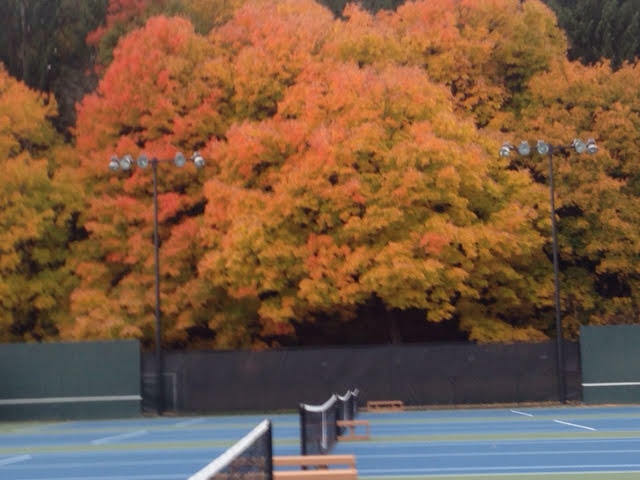 We were indeed fortunate to have beautiful fall days and the vibrant colors of fall flanking the courts added to the ambiance. Smith Team preparing for NEWITT, 2016! Play began on Friday at noon with a team tennis format of 2 playing making up a team. Both players competed in singles and doubles against their opponents. The team participants for Smith were Margaret Anne Smith who paired with Samantha Peikes at number 1. Noa Dubin and Janan Fugel were team 2. Alexandra Steck and Kelli Cheung made team 3. Kara Van Allen and Christine Yee were team 4 and Evie Hoffman and Tess Ostoyich made up team 5. Sam and Margaret Anne drew the Trinity 1 team in first round. Sam won her singles and Margaret Anne was edged by her opponent. The two played a competitive doubles but Trinity won so the match score was 1-2. Noa and Janan had a 1-2 loss versus Wheaton while Alexandra and Kelli defended their ground, moving to the next round in the main draw, after defeating WNC 2-1. Kara and Christine bowed to Colby-Sawyer 0-3 and Evie and Tess lost 0-3 to Springfield. In day two , the senior team of Alexandra and Kelli continued their winning streak as they defeated Babson, in what may have been their personal bests! This senior team peaked at the right time! All other Smith teams moved to the consolation rounds. Sam had to make an emergency exit from the event and Emma Essenmacher left the tournament desk to fill in last minute. They lost their doubles to Simmons but Margaret Anne came back with an excellent singles win to even the score. Emma jumped in to play her singles and she came very close to upsetting the Simmons player in a steady three set match. Our captain and warrior, Margaret Anne is remembered by most coaches and players because of her tenacious style on-court. She will never give up. Her matches often go three or more hours as she skillfully loops her high shots to baseline over and over. Almost all of her opponents dread to see her walk onto their court because they know she will never quit. She has mastered the drob shot (half drive, half lob) and lob in an attempt to outlast and frustrate her opponent but she uses what abilities she has to the maximum and always stays mentally positive throughout. She is patient, determined and physically strong and able to get to almost any shot handed to her. She is positive in spirit and determined on the court. She is a delight to coach. 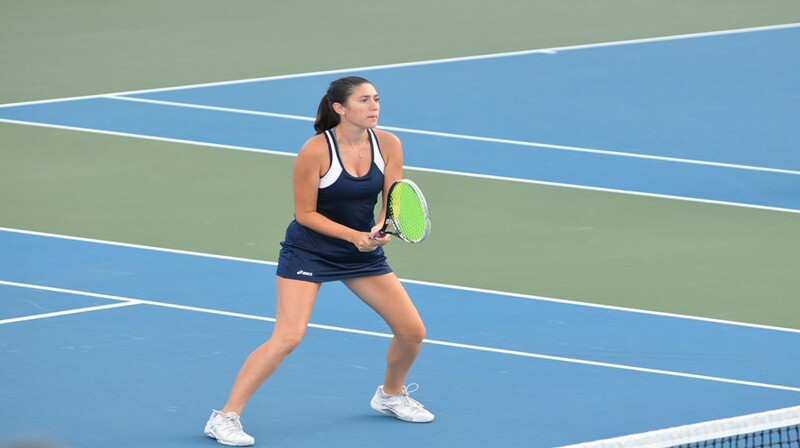 Her dedication, determination and fitness helped her to gain the best singles record on the team this season. The commitment of those who were not on court was commendable and noteworthy. A special thanks goes to Emerson Barry and Emma Essenmacher for getting out and playing when called on at the last minute. Emma overcame her injury to go three sets in the B flight with the Simmons player! Emma did the lion's share of work at the tournament desk. Joanna and Toula also took charge of the desk for a time and was joined by Annina Van Riper later on. All did a great job of keeping the tournament moving. Emerson deserves special notice for collecting all the scores on Saturday evening! Leigh Johnston was involved in campus work but made her cameo appearances now and again adding to the excitement of the weekend. 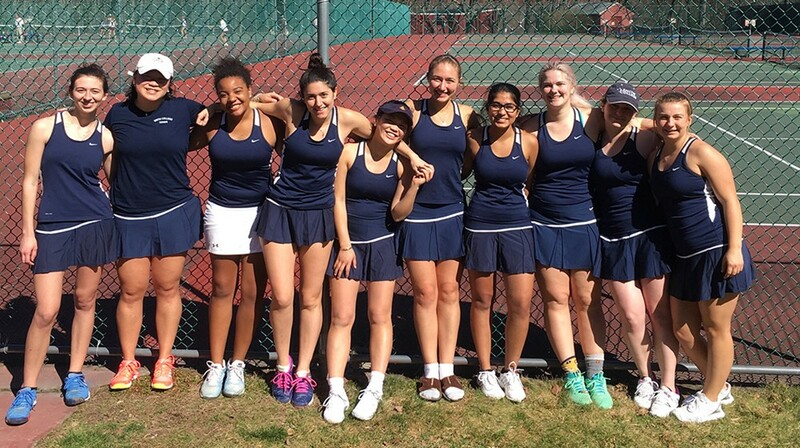 Smith Tennis finished on a strong note on this weekend and for the season. They plan to continue their strength and conditioning workouts in the off season and they hope to start captains' practices soon. They will be back in competitive action this spring. 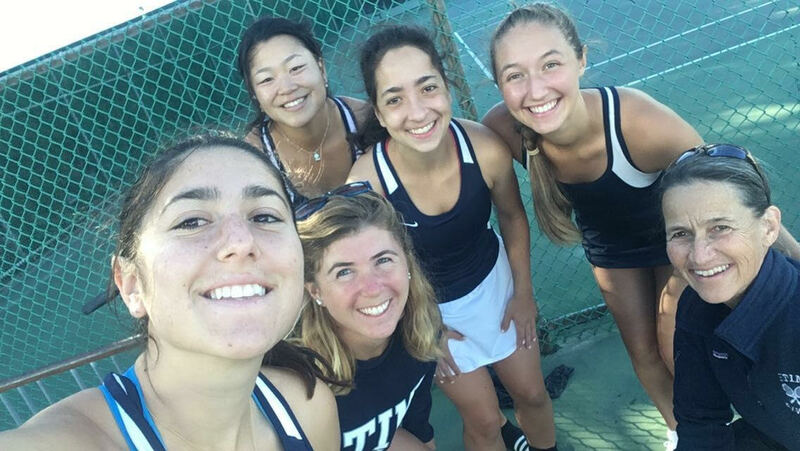 Smith Tennis opened October break on Saturday, October 8 with an exciting 7-2 win over Emerson in the final dual match of the fall season. The match score does not indicate the closeness of the match as it was undecided until the end. Number 1 and 3 doubles got Smith off on the right foot as they won 8-6 in both matches. 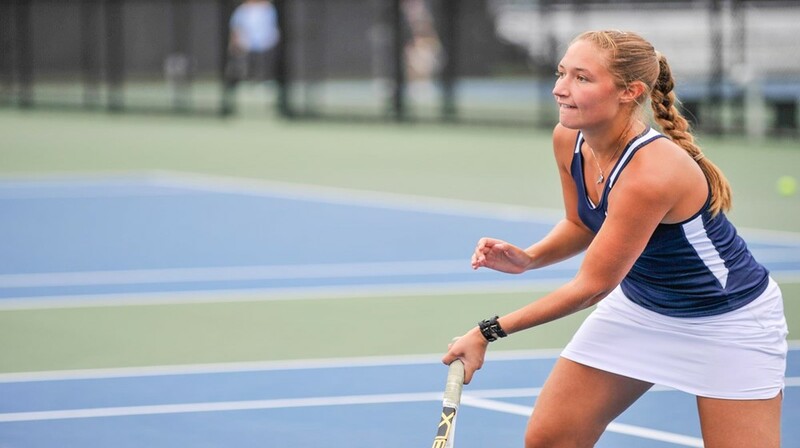 It looked as though Smith would take all three doubles for a decisive lead but Alexandra Steck and Kelli Cheung lost a heartbreaker at number 2 doubles bowing to Weingarten and Parikh 9-7 after the two Pioneers had a 7-2 lead. Entering singles with a 2-1 lead, Margaret Anne Smith wowed the spectators as she dismantled her tall, strong opponent 6-0, 6-0. From then on it was a battle between the two schools but Smith managed to stay strong and determined throughout eventually taking 5 out of the 6 singles. Joanna Kim went three sets to overcome her opponent and Sam Peikes came from behind in both sets to, once again, bring in the winning team point. 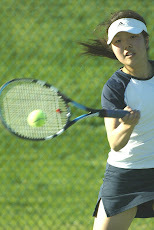 Christine Yee, in her patient, persistent style edged her opponent to gain a 7-6 (9-7), 6-4 win. The back to back wins for Smith, however, still left them one match win short of qualifying for the conference tournament. Fall break did not end here as Smith rallied Sunday morning to a series of clinics offered by Tim Klitch of Austin Texas. Tim is a national level tennis player ranked 11th in the men's 55 and over. He brought his expertise and offered the team tips and strategies that they could immediately put into play. He challenged the team to think beyond strokes and begin to cut down the size of the court and cut off angles through positioning and shot selection. He demonstrated his prowess as he took each player, willing to step up to the challenge, in well orchestrated singles points leaving most defenseless. The Smith team rose to the challenge and gained from the experience. 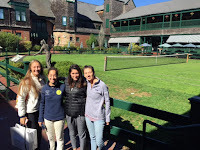 Next, Smith Tennis boarded a bus to Newport, Rhode Island where we visited the International Tennis Hall of Fame and all gained renewed appreciation for the history of this great game and those who have gained fame and success playing the game! 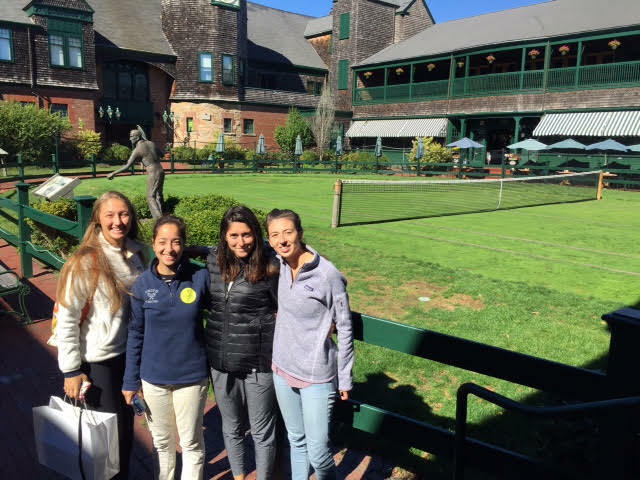 We had a spectacular fall day to travel and we moved from the Hall of Fame to Salve Regina, who graciously added us to their schedule, where we competed in a doubles scrimmage. 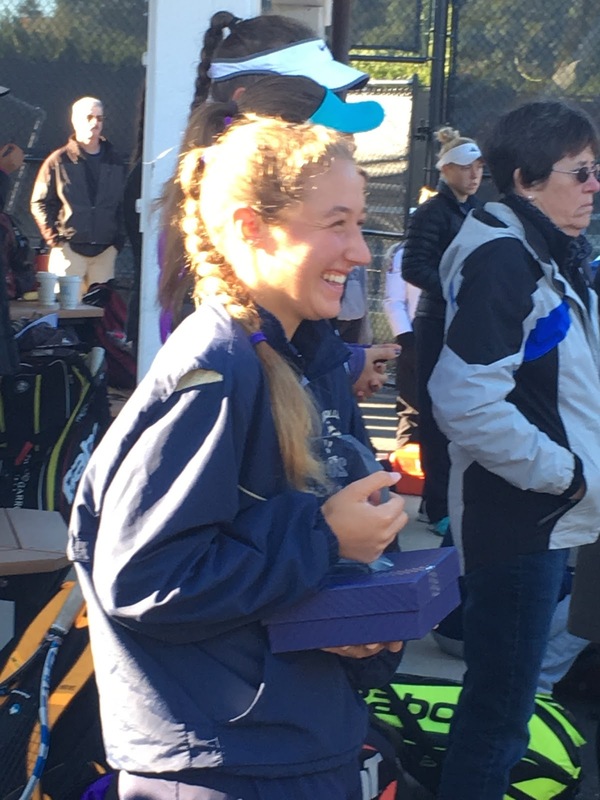 All 12 Smith team members traveling to Newport played in the six doubles matches and Smith was victorious in 4. 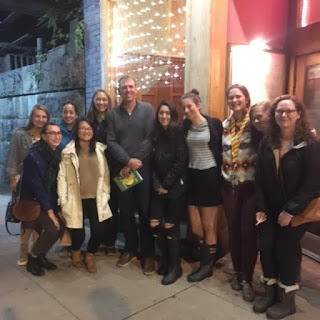 Dinner was next on the agenda and we dined in Newport before returning to campus. It was a fun October break full of good memories, for the most part, barring a traffic accident with three of the players. The good news is that those players will be back in action very soon and we will need them as we head for the historic NEWITT tournament starting Friday, October 14. We are hosting the event along with MHC so, if you are in the area, please plan to come and see some great tennis.